2-CD Set for Viola. Composed by Wolfgang Amadeus Mozart (1756-1791). Sheet music with CD. Music Minus One. Classical. Softcover with CD. 40 pages. Music Minus One #MMO4520. Published by Music Minus One (HL.400771). ISBN 1596157798. 9x12 inches. Featuring Wolfgang Klos, viola. 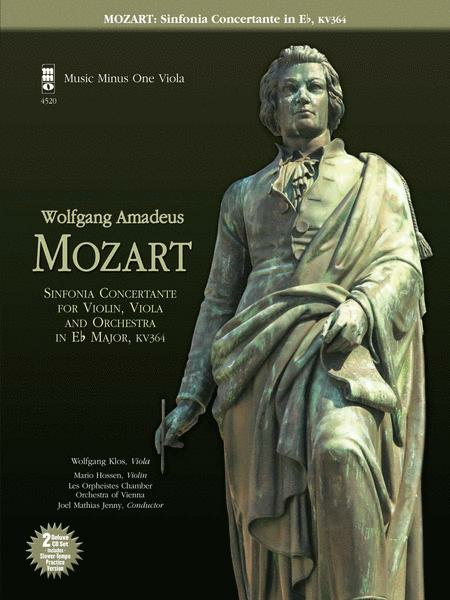 Here is the viola version of one of Mozart's most memorable and unusual classics, a blend of symphony and concerto. The viola stands beautifully against the violin both in unison and in their dialogue, and now you have a chance to stand front-and-center with virtuoso Mario Hossen on the violin and Les Orpheistes Chamber Orchestra, under the direction of Maestro Jenny. Includes slow-tempo practice accompaniments of the faster outer movements. December 29, 2012 I love this piece! College I minored in Music and had a chance to perform the Sinfonia Concertante for violin and viola. This was my final exam and my audition piece for a seat in SF Symphony orhcestra. Will always treasure this experince.